Candle Light Fondue TwinkleWhat makes the Candle Light Fondue Twinkle special is the fact that it’s heated by five tea lights. These twinkling candles keep your cheese warm. It also adds extra ambiance to your cheesy dipping of vegetables, bread, and meat. 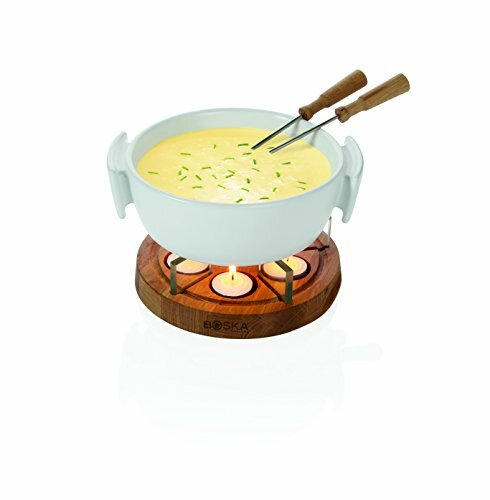 It’s perfect for cozy summer nights in the garden under the stars.-AWARD WINNING DESIGN: This product won the prestigious Red Dot Award for Product Design in 2016-SIMPLE & ELEGANT: This fondue set is heated by candle light - no lighter fluid, no cords - adding a romantic ambiance to your evening-FIREPROOF & MICROWAVE SAFE: Melt your cheese or chocolate in a flashCheese Fondue: A Grand Swiss TraditionThe word fondue is a form of the French verb fondre (“to melt”). It’s a dish that’s gaining more and more popularity - because who doesn’t love dipping bread and other garnishes into fresh, hot cheese? The most classic Swiss fondue recipe is made with cheeses such as Gruyere, Vacherin and Emmentaler. However, cheese fondue comes in many varieties. The ready made versions found in the supermarkets are usually a fine starting point to invent your own creations.MaintenanceThe fondue pot is microwave safe as well as dishwasher safe. The oak base is best cleaned by hand. A monthly rub of mineral oil will keep the wood looking great.Contents1 Liter stoneware fondue pot | Oak wood base with glass dividers | 4 stainless steel fondue forks with oak wood handles | 5 tea lightsAbout Boska Holland Cheese waresWe love cheese! Since 1896, here at Boska, it’s been our mission to spread the love of cheese to everyone everywhere. Our innovative family-owned company started as a blacksmith making tools for the cheese farmers in Holland, and now we are the world’s only specialist in Cheese wares: cheese tools and accessories. In short: we sell everything you need to enjoy cheese except the cheese itself!